Notice I didn't Photoshop out its red beady eyes - that's cause they ARE red and they ARE beady. This by the way is Lily. 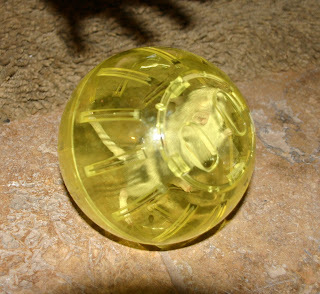 Here is the other one - Chelsea - rolling around in her stupid little ball. How screwed up is this - Yeah, put me in a round ball with a few air holes and I'll roll around in it for an hour or so. 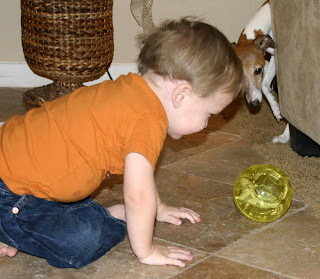 Garrin has taken to "rolling" the ball thingy across the floor. Whew!! That's gotta give the rodent quite the headache! 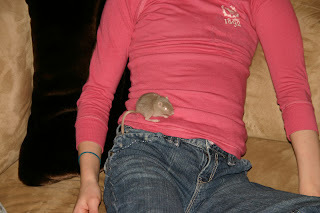 Hannah has taken a liking to Lily only, while poor little Chelsea gets neglected. I can see where this is going already. Isn't that sweet? A furry little gnawing mammal, with glowing red eyes, sharp little claws, razor-like teeth, just sittin' so dang pretty on Hannah? How cute is that???? You spelled LILLY and CHELSIE wrong!!! They are cute and you admited it. 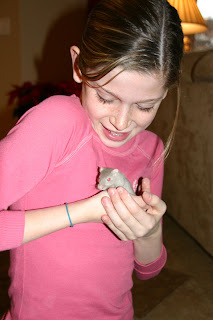 1. any of numerous small burrowing RODENTS of the genus Gerbillus and related genera, of Asia, Africa, and southern Russia, having long hind legs used for jumping. 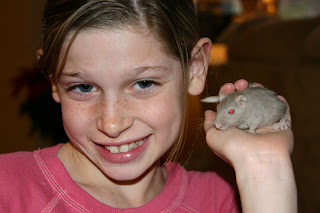 they are cute but the red eyes kinda scare me!!!!lol!!! !